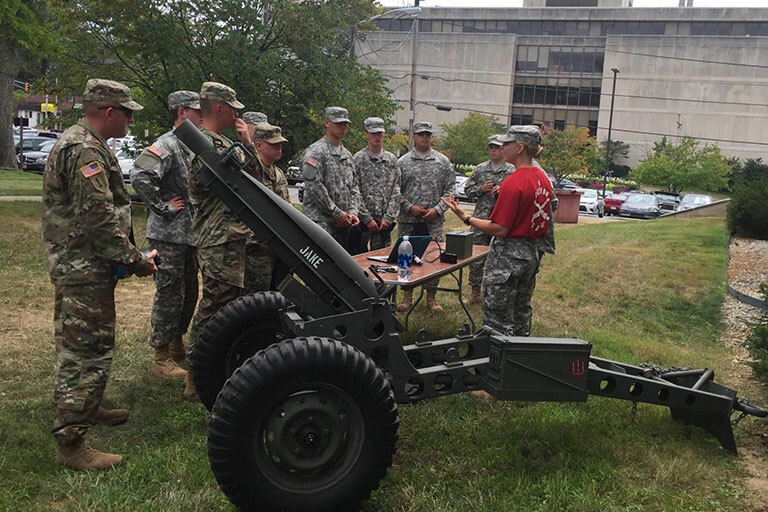 When Courtney Linnemeier attended an Indiana University Bloomington football game as a high school senior, she noticed the IU Army ROTC cadets assembling the cannon, "Big Jake," before the game. Already knowing she wanted to pursue a career in the military, she wrote down the phone number she saw on the side of their van and later gave them a call to learn more about the program. Linnemeier, who is now a junior at IU and heads the cannon crew, laughs about this memory that marks the beginning of her journey as an ROTC cadet. "It's so funny because the same van that drew my attention is now the van I use to transport the cannon to and from the football games," she said. "That's where it all got started." She originally wanted to enlist in the military directly after high school, but she was encouraged by her parents to get her degree first. The award-winning ROTC program, coupled with the wide variety of majors to choose from, made the decision to attend IU a "no brainer" for Linnemeier. And she didn't waste any time getting involved in all the leadership development program has to offer. In addition to the required two military science lectures, a military science lab and three physical training sessions per week, Linnemeier is involved in five of the program's optional clubs. As the leader of the cannon crew, she manages the team of ROTC cadets present at each home football game to show the cannon off to visitors and fire it after IU scores. She's a member of the Scabbard and Blade club, for which she hosts study tables and tutors other cadets, and of the drill team. Last year, she started Bison Stampede, a club that allows the cadets to get together weekly for group workouts, like swimming and cross-training. 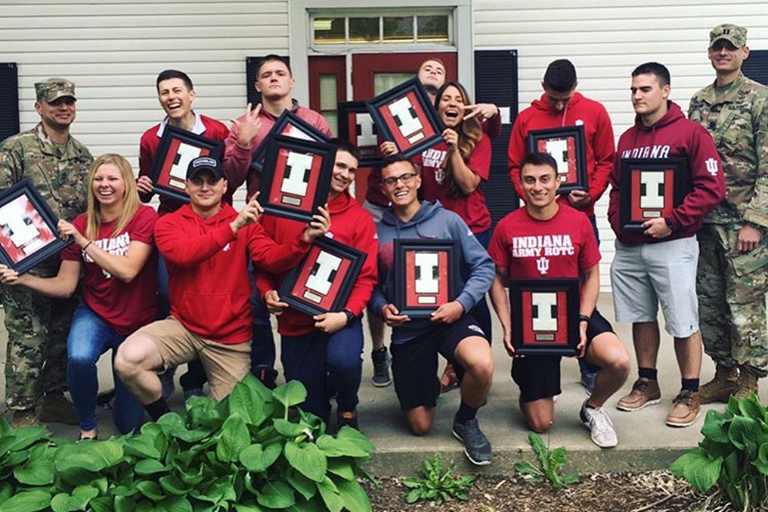 Linnemeier is also in the group that represents IU ROTC in Ranger Challenge competitions, a varsity sport that matches schools against each other in a series of mental and physical military tasks. "Some may say I'm a little over-involved," she said, laughing. "But I believe if you're going to do something, you should do it fully." Students can be involved with ROTC for up to two years without making a military commitment, but Linnemeier signed her official contract last November. The day after she graduates from IU, she will take an officer's oath and hopes to be commissioned as an active-duty second lieutenant in the United States Army. The leadership skills she actively demonstrates makes her a great fit for IU ROTC and the Army, said Todd Burkhardt, the ROTC director and a professor of military science at IU Bloomington. "Courtney is mentally tough, physically fit and dedicated to constantly improving herself and the team," Burkhardt said. "She's engaging, genuinely cares for people and fosters cohesion. There's no doubt that she leads from the front." Linnemeier's passion for ROTC allowed her to find a place in the group quickly, but choosing a major didn't come as easily for her. She switched her major six times before finally deciding on informatics. By adding public health as a focus area, she is hoping to use her degree to teach individuals with special needs after her time in the Army. "I want to help them develop themselves and the skills they need to be active members of society," she said. "Technology seems like the best way to do this, because that's the way our world is going." Linnemeier herself knows what it feels like to be a minority. Of about 150 total members, she is one of only 20 women in the IU ROTC program. But she doesn't let that stop her from doing her best. In fact, she chooses to use it to push herself forward. "At first, I felt like a minority," she said. "But then I realized we are all working towards the same goal of becoming a second lieutenant, and our leadership ability is really what it's all about." "I know I can keep up with the guys, and, if anything, we push each other to work harder." Anna Bailey, a freshman in ROTC, said Linnemeier's positivity and leadership is inspiring to the younger members, especially the women in the group. "She's so involved and leads in so many aspects," said Bailey, who shadowed Linnemeier when she came to IU to check out the program as a high school student. "Women are minorities in this program, and it can be hard to break through those stereotypes, but she doesn't let that affect her. When I'm at that level, I hope to be just like Courtney." Having a community and people to look up to was one of the biggest aspects that drew Linnemeier to ROTC when she was searching for her post-high school path. Before joining ROTC, Linnemeier said, she would never have described herself as outgoing, and the program opened the door to opportunities and friendships she might not have enjoyed otherwise. "I wouldn't still be at IU without ROTC," she said. "I've learned to be a leader, developed relationships and bonds with so many people, earned a varsity letter and am part of a team everyday." "That's all because of IU Army ROTC."